Washington, DC – Activists from several national and international pro-life groups gathered at a Planned Parenthood abortion clinic in the nation’s capital this morning to protest Planned Parenthood’s racist roots and policies and to call for the defunding of the nation’s largest abortion provider. 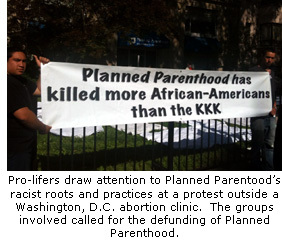 The protest, organized by the Washington, D.C. based Christian Defense Coalition, featured “sheets of shame” displayed on the lawn outside the Planned Parenthood facility as well as signage that informed the public that Planned Parenthood has killed more African-Americans than the KKK. account for over 35 percent of the abortions. Planned Parenthood is known to target minority neighborhoods for abortion. Literature from Life Dynamics, Inc. was distributed documenting these facts. The protest was attended by activists from all over the nation and several foreign countries. 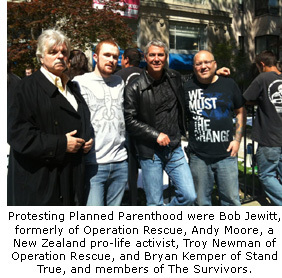 Some of the groups represented included Operation Rescue, The Survivors, and Stand True.